As 2011 is now over, it seems only natural to have some sort of concluding post to round out the year. While some other bloggers have done some form of 2011, I decided to go ahead and do the "geeky" thing and give a bunch of different awards. The Flash: The Flash will be a smaller review. Sometimes I go to a restaurant by myself and I only order a few things. I mean to go back and visit and order more things, but I don't get around to it. Rather than sitting on these reviews, I'm going to start giving some coverage of these places. Restaurants featured in The Flash will not be eligible for awards until they have been flashed at least 3 times. Interrupt: Besides the initial posts on China, I've largely kept my coverage San Diego based to this point. The interrupt will feature coverage of restaurants outside of San Diego (primarily in Orange County and LA). Some interrupts will be longer and feature full tasting menu reviews while others will be more like a flash. Restaurants featured as an Interrupt are eligible for awards. In the new two-update per week format, my tentative plan is to have one post be the same full-length review that I have been posting up to this point, and the other post be either a flash or interrupt. Best Protein Encased by Carbohydrates - This award is meant to encompass any form of sandwich, taco, burger, or other meaty filling surrounded by some sort of carb. Best Savory Baked Carbohydrate with Toppings - This award is meant to name the best pizza, flatbread, or similar concept food item. The Soft-shell crab club at Devilicious features a soft shell crab with bacon wrapped in a cheesy sourdough sandwich. What really makes this dish for me was that the soft shell crab is of high quality and fried just right so that the flavor of the roe in the crab is still retained. The fennel sausage with the leeks and fennel pollen really brought out all the flavors in this dish. Combined with the legendary Mozza pizza crust and this pizza was easily ran away with the victory. While Pizzeria Mozza had an excellent pizza, the Brunoverde still holds the top spot for me of San Diego pizzas. The Brunoverde has the exact correct balance of richness and pepperiness, and was a white pizza on top of it. The Dahi Puri contained exceptional balance of flavors, and really surprised me that I could find a dish of that caliber in a (relatively) small mom and pop place. The key to this dish for me was the tamarind date mint water. The Peking Duck in Beijing was exceptional. The way the skin was fried along with how well the rest of the duck was cooked to maintain flavor and moisture was a real surprise for me. I also enjoyed how Da Dong had three different methods for eating the duck. The flavor of the uni permeated into the entire Chawanmushi. Above the top layer, there was a layer of black truffles that added an amazing richness to the entire dish. While I was underwhelmed by some of the other dishes at Cavaillon, this dish left me completely satisfied. 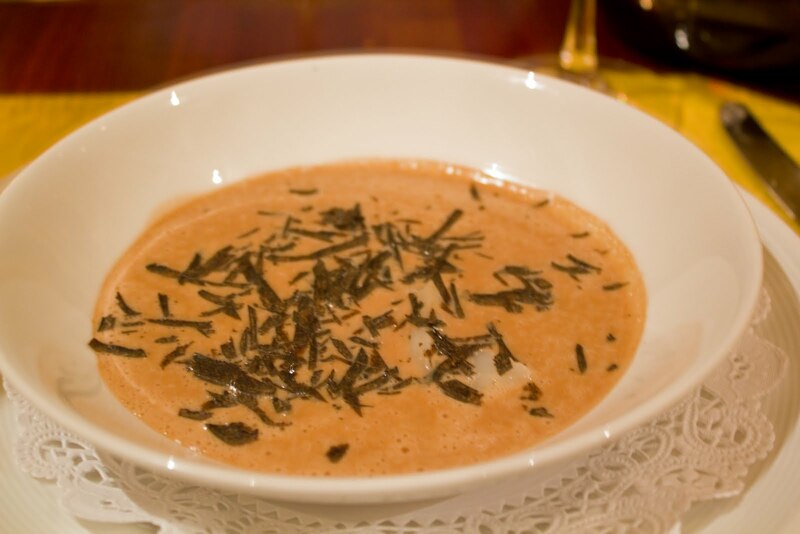 The richness and purity of flavor in the veloute was extremely impressive to me. Alone, the veloute was already amazing, but coupled with some raw slices of scallop and black truffle, and this dish was elevated to a higher level. I was ready to award this for just the Ciccoli, but then I remembered there was a charcuterie that contained duck mousse, lamb speck, and even a chicharrone. This plate was almost too much to hope for and contained an amazingly fine selection of high quality charcuterie. The goat soup at Super Cocina contained a healthy dose of that low and slow gelatinous broth as well as some very tender goat meat. The combination of spices in the soup was a great flavor combination and contained just the right level of spice to compliment the goat. This ceviche from La Playita contained all of the various seafoods available at the restaurant - fish, octopus, scallop, shrimp. While it was a huge portion, it had an amazing combination of flavors and was well-prepared. The sous-vide Brisket dish at Blanca was one of my favorite dishes of the year. One of the best ways to sum up the dish was a comment I heard about the dish from another diner - "Wow, is this what beef is supposed to taste like?" The preparation of the dish really highlighted the grass-fed flavor of the beef along with a great meat to fat to chewiness ratio. The Strauss Yogurt Panna Cotta contained the best overall composed dessert. The panna cotta had the correct texture and the additional elements on the plate added a balance of sweet, sour, and crunch to round out the dish. What set this dessert apart from the rest of the field was the inclusion of the fizzy melons with the dessert. This allowed the dessert to act as a palate cleanser along with being a great dessert in its own right. However, the fact that it was also a palate cleanser is what kept it from being just the best overall dessert. Not only was the ramp butter delicious, fellow blogger Gourmand's Review and I still talk about it in hushed reverent whispers. It's a shame that I didn't get a good photo of the butter in the foreground. While the veloute wasn't a real surprise, the syringes that it came served in was a big surprise, and it was a lot of fun to eat. To add to the surprise factor, the coating of espresso at the nozzle added a great touch of flavor and really elevated the dish. The Still Life is one of Chef Gavin Schmidt's signature dishes, and it is well deserved. The still life has a great deal of umami from the dashi covering that completely complements the high quality seafood items encased. The smoked avocado puree adds the great smoky depth of flavor which is contrasted from the sweetness of the apples. The Onion at George's was a huge surprise to me. Each layer of the onion peeled and contained a slice of black truffle, and the entire dish was cooked in a precise technical manner. The dish really captured the essence of the truffle. The comte provided a great contrast in saltiness and milky flavor. Another truly wonderful element of the dish was the aroma, which was entirely of the truffle. With the way the awards were stacking up, it should come as no surprise that Blanca earns top honors. On attending the final meal at Blanca, I was treated to a his/her menu containing one of every item off the menu at Blanca. In terms of breadth, this menu was extremely impressive. However, what was more impressive was simply that every dish was extremely well executed and tasted amazing. To find the best overall dish of 2011, you have to go all the way back to the first tasting menu I had of the year. The pork dumpling with foie gras and black truffle was easily the best and most memorable dish of the year for me. The dumpling was brought out in small cups with lids that when lifted completely enveloped the room in the wonderful truffle aroma. To top off the richness, the inclusion of foie gras threw this dish over the top. The dumpling itself was well constructed and the dumpling skin was hand rolled of the exact correct thickness. Glad to know that you like 'Dahi Puri', I tried that in India but not really into that. But it is the most popular street food or "小吃" in India.